It's Wednesday!! 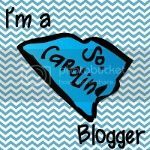 One of my favorite days...half way through the work week and time to showcase another fabulous Budding Blogger! Hello everyone! 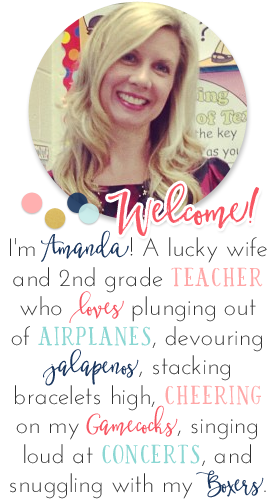 I'm so excited to be featured on Amanda's blog as a Budding Blogger! Yay! 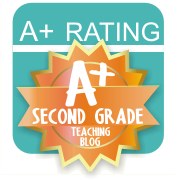 My name is Janet and my blog's name is Mrs. D's Firsties. I have been married to my wonderful husband for a little over 4 years. We have the sweetest dog named Tobey. My dog is like my baby. We don't have any human kids (yet)! I love watching TV and shopping (at Target). I walk into Target for one thing and end up spending $80... never fails. I've been teaching for 7 years and I've spent 5 of those years in 1st grade. I belong in 1st grade for sure. I just love the age because they come in so needy and dependent and leave so independent. LOVE. I love teaching Science and Math. I feel like Science and Math are so interesting and can be made really "hands-on" and fun. What would we see if we popped into your room unannounced? You'd see some Whole Brain Teaching (amazing) and you'd see 22 little, kind kiddos that are actively engaged (most of the time...). You'd also see a lot of green. I think green is super calming and my theme is bugs (and green). I like things orderly and organized.. so hopefully you'd see a tidy classroom, too! Seltzer water... or some kind of carbonation. I'll drink a diet pop if I'm in a pinch but, boy do I love my club soda! What is your "can't live without" teaching resource? I try to make everything as engaging and hands-on as I can. I like the students to be up, doing, and learning. I have a Promethean board and love to create engaging flipcharts where the kids can come up to drag, write, erase, and highlight. I also love to use the ActivExpressions (we call them "voters") for my tests and quizzes. My last Science test was given completely on the voters and the kids did AMAZING! They love to use them because they are like little cell phones... who wouldn't want to use that? What is one of your blogging goals for the year? Honestly, I want more followers! ;) But, in all seriousness, I want to write interesting, informative posts. I want to start putting more pictures up of what we are doing in the classroom. I'm horrible at remembering to take pictures and I'm even worse at remembering to put them in my posts! What are you waiting for? Go ahead and click on the button above to become a follower of Mrs. D's Firsties!